There have been hints for a while that the centre-left in Europe faces a dilemma, torn between its support for internationalism and the European project, on the one hand, and its opposition to austerity on the other, Barely two months before the European Parliament elections, the dilemma has become acute. If social democrats cannot find a way to reverse austerity in Europe, at what point should they concede defeat on debt-mutualisation, genuine fiscal and monetary stimulus, and support a Eurozone breakup and/or serious debt re-scheduling? The status quo, as it stands today, is unacceptable. I welcomed John Grahl’s insightful piece,on the intellectual cracks emerging in the European austerity consensus and agreed with what seemed to be his tentative optimism that ‘the EU could still be rescued from its disastrous response to the economic crisis’. Furthermore, there is now robust evidence of a statistically significant correlation between levels of fiscal consolidation and the degree of economic contraction in Eurozone economies. Greece – the most extreme example – is now in its sixth year of recession, with a ratio of debt to GDP of 175%, exceeding its 2009 level by 45 percentage points. It is yet to be seen how a slight change of course in Greece could affect the economy and, as important, whether it will be acknowledged. Likewise, it is by no means obvious that the pain of breakup would be worse than the pain of what is now looking like a never-ending horizon of internal devaluation and miniscule growth. 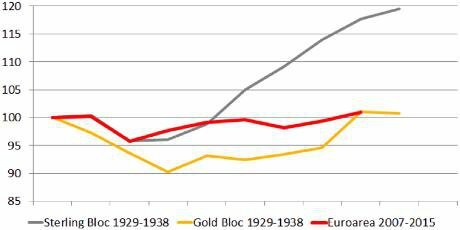 Nicholas Crafts provides a good discussion, including a striking graph, comparing the Eurozone ‘recovery’ to the post-depression recovery in the 1930s, and the degree to which staying fixed to gold held some economies back. It is in this context that we should view the European Commission’s recent upgrading of its Eurozone growth forecast to 1.2% for 2014. But the social democratic response, since Grahl’s piece, has become, if anything, even more muted. Centre-left parties in Europe appear to have completely lost the argument for pragmatic fiscal policy, much in the way that US Democrats seemed to lose their own case precisely at the moment when stimulus was working. Consider again how little financial commitment it would have taken to have shored-up confidence in Greek sovereign debt via Eurobonds. Greek debt in 2010 represented only 3.6% of Eurozone GDP. François Hollande’s government was supposed to be making the case for Eurobonds. This January, the British Labour Party signed up, broadly, to the Conservative-led coalition’s austerity program, pledging (if elected) to run a current budget surplus by the end of its term and to legislate for annual current budget cuts. It has taken this step not because it believes tying its hands in this way is sensible economic policy but because it feels it has now lost the argument on the causes of the crisis. Interest rates on British bonds stand at record lows, growth is sluggish and output gaps remain, un-invested cash from monetary stimulus piles up on the balance sheets of banks and public companies, and real wages fall for the 4th consecutive year (the longest period for 50 years). Could there be a worse time to lock a government into a balanced current budget unless one actually welcomed another private sector debt bubble? Likewise, we have the German Social Democratic Party (SPD) in a grand coalition with the architects of European austerity, the Spanish Socialist Workers’ Party (PSOE) is more unpopular than a deeply unloved People’s Party (PP) government in Spain, and the Greek centre-left are seen as puppets of the Troika and their coalition partners. Perhaps too much hope now rides on Matteo Renzi but he seems to lack a strong hand. The [austerity] consensus now spans the whole political mainstream. If you live on the European continent and if you have a problem with Say’s Law, the only political parties that cater to you are the extreme left or the extreme right. It is yet to be seen how the campaign of a strongly anti-austerity Party of European Socialists (PES) candidate for European Commission President (Martin Schulz) will fare in the context of so many PES member parties having signed up to austerity. The British Labour Party didn’t even vote for Schulz at the party congress this month. This is a social democratic dilemma and not a broader ‘Left’ crisis because I think social democrats are more committed to the idea of a functioning European Union than the far-left. Moreover, the centre-left has a responsibility for ensuring that the institutions it helped shape are used to progressive and democratic ends. But we must be politically realistic. Debt mutualisation and a European-wide New Deal now appear more distant than ever, whatever the results of the upcoming European and national elections. So where does this leave those of us who refuse to vote for more austerity? The far-left and the libertarian right are assured that the benefits of breakup would soon outweigh the costs and, like other painful currency union collapses or major defaults, we would see high inflation followed by a gradual return to competitiveness. But things remain unclear. We cannot estimate the percentage of people who would lose out immediately from a breakup, know the degree of panic that would follow from rescheduling, or predict the degree to which hyper-inflation would bite (potentially opening the door to extremism).